Homeowners love accordion shutters. Business owners love accordion shutters. What makes this type of shutter the most popular shutter in Delray Beach? Accordion shutters from Empire Construction & Development are an affordable, easy, and dependable way to protect homes and businesses from all kinds of threats. Protecting your windows and doors from hurricanes and other storms, extreme weather, and break-ins is important. But these openings aren’t the only area of your building you should secure. 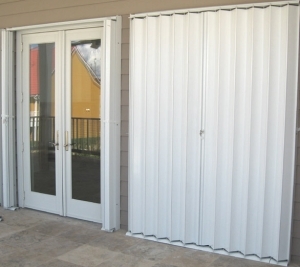 Whether you want to protect your home or business in South Florida against powerful storms, theft, or both – you should also secure areas like patios, balconies, terraces, and storefronts with strong accordion shutters. 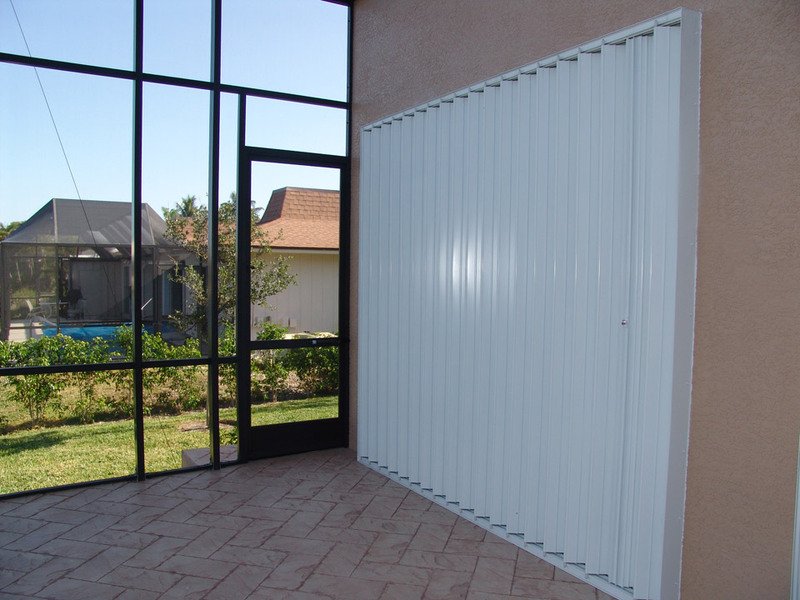 And accordion shutters in Delray Beach, Florida made by Empire Construction & Development are the best storm and security shutters for the job. Our affordable accordion shutters in Delray Beach are made of strong aluminum that will hold up during hurricanes and severe weather. These shutters are designed to meet the toughest wind codes in the country and are made to withstand impact and extreme conditions. Accordion shutters can be permanently installed on homes and commercial buildings for reliable storm protection and building security. Your home remodeling project may not be complete without accordion shutters. While you’re updating your home and adding new home fixtures, don’t forget to protect your investment. Prevent costly storm damage and property damage due to theft by installing accordion storm and security shutters from Empire Construction & Development on your home. Installing our expertly-designed accordion shutters on your home can increase the value of your home and let you quickly prepare for storms. If you want another type of shutter, take a look at the great shutters for homes and businesses in Delray Beach, Florida that we manufacture. Get accordion shutters for an older home that may not be equipped with up-to-date storm protection. 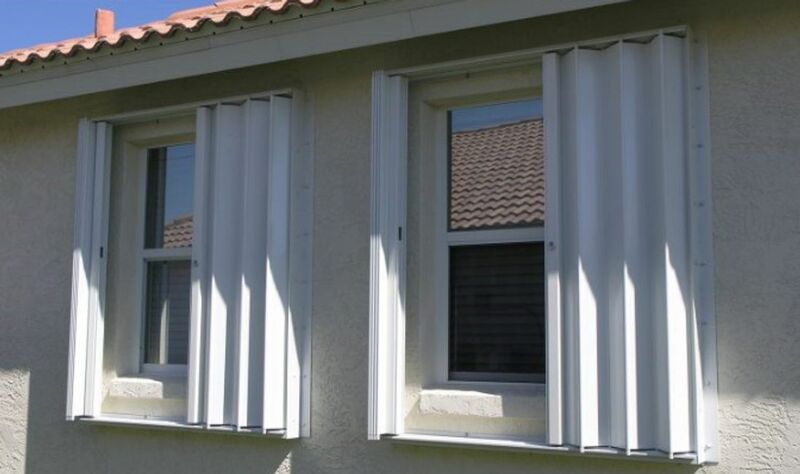 Preparing for the next hurricane or tropical storm will be a lot easier once you have the best accordion storm shutters in Broward County installed on your windows, glass doors, patio area, balcony, and other openings on your property. These strong accordion shutters slide open and closed along a track and are made with a locking device. Securing your home before a storm will be easy. Get accordion shutters for your restaurant, store, or other business for storm protection and added security you can count on. Accordion shutters let you close up your restaurant, bar, or retail store before a storm and they let you lock up your business overnight too. If you want shutters that are great at preventing break-ins and theft, our popular accordion shutters are a great choice. 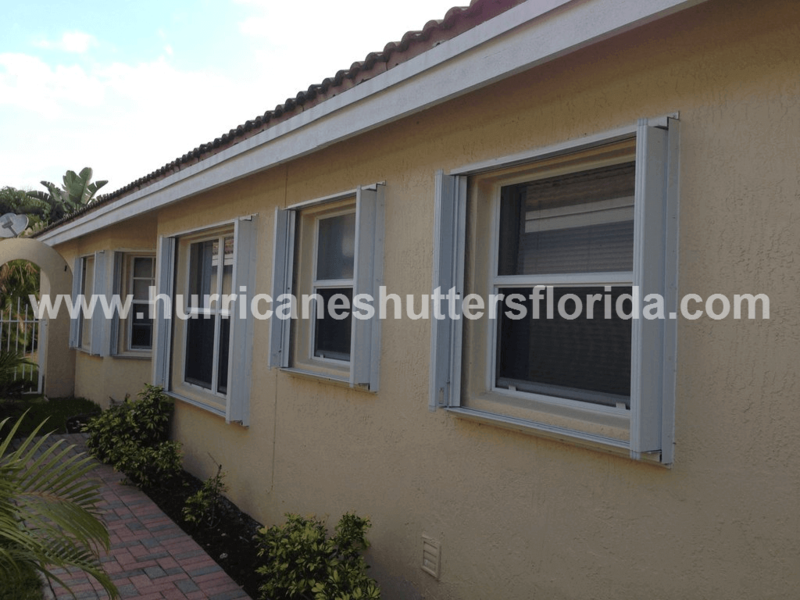 Get the shutters you need for your home or business at HurricaneShuttersFlorida.com. 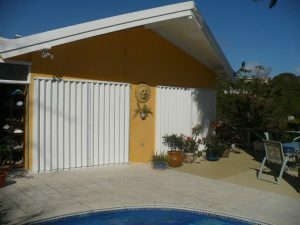 For the cost of accordion shutters in Delray Beach, contact us for a price quote. For questions about shutter installation and more, call: 888-474-3555. Protect your entire home or business in Delray Beach, Florida with accordion shutters from Empire Construction & Development. Hurricane protection is something you can’t go without in Florida. Homes and other buildings in cities close to the Gulf of Mexico, like Pensacola, need extra-strong storm protection. Hurricanes can strengthen quickly in the Gulf and can bring dangerously high winds and heavy rain to Florida’s panhandle. One of the best ways to protect your home or commercial building in Pensacola from storm damage is to install strong accordion storm shutters on your windows and doors. At Empire Construction & Development, we custom-make accordion hurricane shutters for our customers in Pensacola. These reliable shutters are made of heavy-duty aluminum, and come with a built-in locking device. Our affordable accordion shutters are designed to adhere to the most stringent wind codes in the country. You can have the level of hurricane protection you need in Pensacola, Florida with aluminum accordion shutters from Empire Construction & Development. Where can I buy accordion shutters in Pensacola, Florida? If you’re looking for accordion hurricane shutters for your home, hotel, office building, restaurant, storefront or other building in Pensacola, find the storm shutters you need online at HurricaneShuttersFlorida.com. You can easily view shutter types and get free price quotes for shutters on our website. When you provide us with your window and door measurements, we will build your shutters to fit each window and door in your shutter order. Call: 888-474-3555 to speak to a member of our storm protection team about your shutter order. Finding and ordering the best hurricane shutters in Pensacola is easy when you order your hurricane shutters online from Empire Construction & Development. How do I install accordion hurricane shutter? 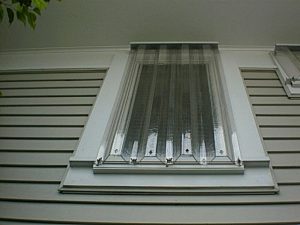 Installing accordion shutters can be a DIY project for a homeowner, or can be done by a handyman or contractor. Scroll down on our accordion shutter product page to watch a how-to-install video for our accordion hurricane shutters. All of the mounting hardware you’ll need to install your accordion shutters in Pensacola will be included with your order. 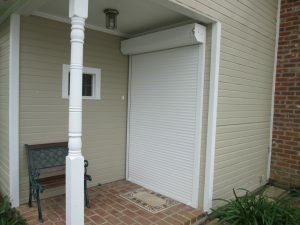 Can I use accordion shutters as security shutters? Yes. Our accordion shutters are sturdy enough to withstand storms, and they are also great for securing your windows and doors to protect against theft and break-ins in Pensacola. Whether you want to secure your storefront window overnight, protect your restaurant after-hours, or lock up your home when you go out of town, accordion shutters are a practical and reliable way to keep your property safe. Choose the accordion storm shutter color that will look best on your home or commercial building in the Florida panhandle. For a free quote on your accordion shutter order, contact us today. 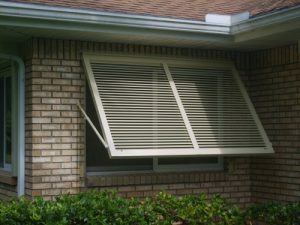 Protect your windows and doors from damage in Pensacola with accordion shutters from Empire Construction & Development. Anyone who has ever been through a hurricane knows how unpredictable these storms can be. A small storm can do more damage than expected, and a large storm can grow even larger and more dangerous when it reaches the warm waters of the Gulf of Mexico. What starts out as wind and rain can leave a trail of damage that takes weeks or months to clean up. Even inland cities of Florida’s panhandle may be at risk when it comes to a hurricane or a tropical storm. To protect your home or other building from damage due to hurricanes, tropical storms, and other bad weather in Calhoun County, you can install accordion hurricane shutters from Empire Construction & Development on your windows and doors. and other hazards during a storm in Calhoun County. Accordion hurricane shutters from Empire Construction & Development are made of heavy-duty extruded aluminum. These shutters close securely over windows, doors, storefront windows, and can be used on large openings like patio areas, balconies, warehouse doors, and more. 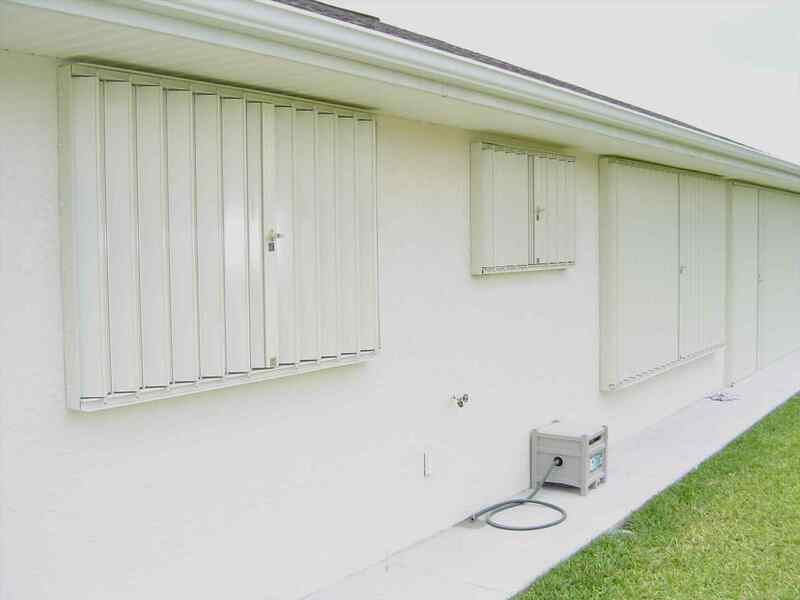 Accordion shutters also make excellent security shutters for your home, store, or business in northern Florida. Our accordion hurricane shutters can be installed by a handy homeowner who wants to tackle a DIY project, by a handyman, or by a contractor in Calhoun County. At Empire Construction & Development, we manufacture accordion shutters to custom fit the windows, doors, and other openings on our customers’ homes and commercial buildings. When you tell us the shutter sizes you need for your building in Calhoun County, we will make shutters for you. 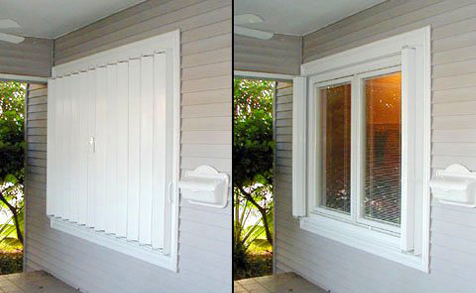 You can choose from four colors for your accordion shutters: white, ivory, beige, or bronze. If you are looking for a shutter that you don’t have to put up and take down, and that is easy to open and close, consider our accordion storm shutters. Accordion hurricane shutters made by Empire Construction & Development adhere to the strictest wind codes in the country and are engineered to withstand hurricanes and other storms. We provide storm protection products that help keep our customers and their homes safe during storms. In addition to accordion shutters we also custom-make rolling storm shutters, Colonial storm shutters, Bahama storm shutters, and we sell aluminum storm panels, clear storm panels and more. 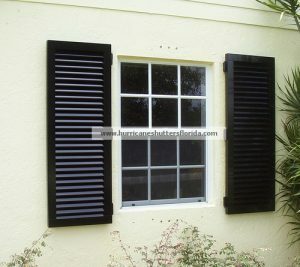 Whatever type of storm shutter you’re looking for, find it at HurricaneShuttersFlorida.com. Accordion shutters are an affordable and reliable way to secure your home or commercial property from storm damage in Florida’s panhandle. To get a price for accordion storm shutters, contact us or call: 888-474-3555 to discuss your order and hear about our storm shutter deals this month. Cover your windows and doors with accordion shutters from Empire Construction & Development and stay protected during a hurricane in Calhoun County. Hurricanes Are on the Horizon- Washington County, FL! You need to take caution! Hurricanes are not a joking matter! They are serious and can cause a lot of harm and trouble for a community, and even more so for a county! People can get injured and even be killed from the destruction that a hurricane creates. The way of life after a hurricane is altered for a long period of time while people try to rebuild what they lost. Businesses are destroyed, or are without power or are unable to receive their merchandise can further delay the community’s effort to get back on its feet, due to insufficient resources and access. It’s heartbreaking to see what happens! That’s why it’s imperative to start taking the steps needed to ensure that you don’t have to go through all the horror of hurricanes can cause, by preparing in advance! Empire Construction & Development and its state-of-the-art hurricane shutters will not only get you through a hurricane, but they will last for many more storms to come in the future! Empire Construction & Development’s Accordion Hurricane Shutters are made especially for windows and doors, storefronts, securing patios, terraces, and balconies, with large expanses all for any house or business in Washington County, Florida. Accordion Hurricane Shutters lock securely for maximum protection against storms, high-winds, and forcible entry and are the best for affordability, protection, and ease-of-use! Due to them being easy to operate, they can be installed in any length because the quality of not having a required reinforcement with vertical braces or supports. These hurricane shutters are the best and here’s why. *Glides smoothly and locks securely! Why wait around? Hurricane season is upon us now! Go get some protection that will last you a long time, not just for one storm. Don’t settle for anything other than the best! Empire Construction & Development IS the best! 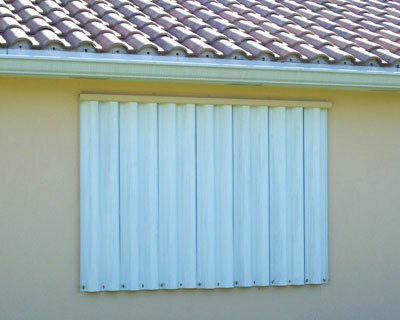 Get the Accordion Hurricane Shutters now and keep your business or home in Washington County, FL safe today! Call Today: 954-474-3557 or 1-888-474-3555 for a FREE quote in your area or try out their online estimation tool to get a price quote. Once you see all that Empire Construction & Development could provide for your needs, you will understand why everyone in Washington County, FL recommends Empire Construction & Development for all their security and protection desires. You won’t regret your decision with Accordion Hurricane Shutters made by Empire Construction & Development, you will be amazed! Posted in Accordion shutters, Hurricane Season, Hurricane Shutters, Storm Shutters | Comments Off on Hurricanes Are on the Horizon- Washington County, FL! You need to take caution!